Just like the title says, this is just a walk in the park. This is meant to be primarily a "used book" cache, for smaller paperback books, but there are other items as well to make it interesting for little ones to exchange "treasures". Cache has been replaced and reloaded with goodies and a new logbook. The cache is in a lock and lock container with a geocaching label. This is a 16-acre park in Ashburn. It is a lovely park for families, runners, bicyclists, back packers, etc. 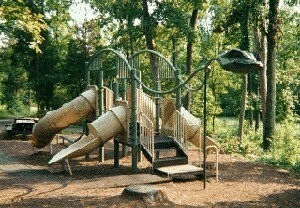 It has four different play areas located closely together for all different ages of children. Dogs are not allowed in the play ground itself, though I have seen some on the trails around there. The terrain is easy, figuring out the best path may not be. The park is a little hard to locate, but worth it to picnic with the family or a good friend! Wear bug repellant! Gloves might not be a bad idea either. There is more than one entrance point, but I believe the best parking is located near the sign post that says Ashburn Park, which is about 0.39 miles (walking distance) from the cache. The parking lot coordinates are N 39° 02.354 W 077° 29.519. Most of the trails are paved and shady, near streams and pretty scenery. If has rained recently, may be a bit muddy in places. Pyhr #1 Nfuohea Cnex vf ybpngrq ng gur raq bs Cnegybj Ebnq bss Nfuohea Ebnq. Pyhr #2 Lbh pna trg lbhe srrg jrg be abg. Lbhe pubvpr. Pyhr #3 Oryvrir vg be abg, ab chmmyrf ner vaibyirq va guvf pnpur. Another of the playgroundsThis is why some refer to this park as "the dinosaur park"